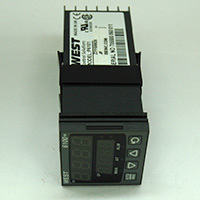 IMS Company - West Controller, Model 6100+, 1/16 DIN, 32-842F Range, Type J, and 2 Outputs. Programmed for use on HH16 Circulator. West Controller, Model 6100+, 1/16 DIN, 32-842F Range, Type J, and 2 Outputs. Programmed for use on HH16 Circulator.